IN the wake of cross-Canada outcry over the verdicts in the Gerald Stanley and Raymond Cormier trials, a pair of Winnipeg teachers are trying to explain the news and debunk stereotypes in the classroom with “ask me anything Indigenous” projects. Christine M’Lot teaches Grades 10 and 12 English at University of Winnipeg Collegiate. 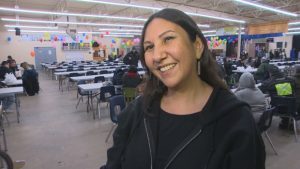 “With all the things going on in the media right now, the Colten Boushie (case), the Tina Fontaine (case), I knew that the students would be hearing about those things in the news, and so I thought it was the perfect time to start an Indigenous graphic novel and continue to talk about these things,” said the instructor, who hails from Winnipeg and has family ties to Swan Lake First Nation. This term, her Grade 10 students are reading Secret Path, by Gord Downie and Jeff Lemire, while the Grade 12s are delving into The Life of Helen Betty Osborne: a Graphic Novel, by David Robertson and Madison Blackstone. M’Lot also passes out slips of paper to her students at the start of class and tells them to write something down — whether it’s a question or not — for her to address later. “I say, ‘Even if you’re not asking a question, you have to write something,’ just so students can’t figure out who wrote what,” M’Lot explained. For queries that leave her stumped, she sometimes turns to her social networks for insight. “I have a pretty strong network of brilliant Indigenous minds on my Facebook and Twitter, so there were a couple of questions where I wasn’t sure how to respond and so I got some feedback,” M’Lot said, citing the former question specifically. Her Facebook friends weighed in, largely saying no, racism against white people does not exist due to current power and privilege structures in Canada. However, individual acts of discrimination can happen. M’Lot borrowed the “ask me anything Indigenous” idea from her cousin and fellow instructor, Tara Williamson. Williamson has taught at the postsecondary level for about seven years, working mostly in Ontario at Fleming College, Ryerson University/First Nations Technical Institute and Trent University. Since September, she’s taught Indigenous studies at the University of Winnipeg, where a mandatory Indigenous course requirement took effect in September 2016. Students have to take three credit hours of Indigenous Studies to graduate. “One of the goals of those classes is to debunk myths and stereotypes. So one of the easiest ways to do it is to address… questions coming from students, right? It’s not like I’m pulling them out of thin air,” said Williamson, who is a member of the Opaskwayak Cree Nation and grew up in Swan Lake. In her classroom, Williamson passes a large envelope around, soliciting anonymous questions about Indigenous topics. Many are curious about employment rates, substance use, treaty benefits and quality of life on reserves, she said. and, for some, their instructor is the first Indigenous person they’ve met. In the coming days, Williamson plans to dive into discussions on the justice system and how it disproportionately involves Indigenous people. “I needed some time as a teacher and as an Indigenous person in the community… I needed some time and space to sort of wrap my head around how I was going to teach (about the Stanley trial), and so we’ll be broaching that subject this week,” she said. Though she can’t quantifiably measure the impact of the Indigenous course requirement on U of W students yet, the instructor said she sees itmaking a positive difference. “I don’t know if I want to call it a success yet, but I do think it’s having an impact. And we’re actually just… the university is in the process of figuring out how to evaluate exactly what that impact is,” Williamson said. Both teachers acknowledged how recent stories, such as those about the Stanley and Cormier trials, can stir emotions for students and themselves. In early February, a jury in Saskatchewan found Gerald Stanley — a white farmer — not guilty of second-degree murder in the 2016 shooting death of 22-year-old Cree man Colten Boushie. Later that month, a jury in Winnipeg found Raymond Cormier not guilty of second-degree murder in the 2014 death of 15-year-old First Nations girl Tina Fontaine. “I know this stuff is very triggering, because I feel triggered even. I see myself as Tina Fontaine when I was 15 and 16. That could have really easily been me as well,” M’Lot said. Check out this resource shared by one of our AAA representatives Kathy Sinclair, doing great work over at Sisler! Canada’s Indigenous Olympians have made incredible contributions to our country’s legacy at the Olympic Games, both in summer and winter events. 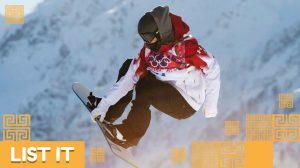 In sports like ice hockey, skiing, snowboarding and curling, Canada’s Indigenous athletes have been competing in winter sports at the Olympic level for over 80 years. Check out CBC kids for more! In September 2017, Winnipeg School Division’s Aboriginal Youth Leadership Program went to Brokenhead Wetland Ecological Reserve to learn about traditional plants and medicines on the land. For more information, click the image above. She started out with poetry, wrote, The Break, a national bestselling book and is now delving into the world of graphic novels. But Katherena Vermette said she didn’t even know she wanted to write it. “I was at Portage and Main, my publisher, and I was talking with the ladies there and talking about how cool comic books are and how it’s exceptionally cool when women write graphic novels because they are still an underserved audience in graphic novels,” Vermette explained. “I was also telling them how they have to get on Métis history because there’s lots of Cree writers, there’s lots of Anishinaabe writers but there’s not a lot of Métis history. So I said, ‘You have to get on that, you have to write about Metis history.’ Which suddenly became me writing a graphic novel about Métis history,” she added. Then along came the character of Echo Desjardins. 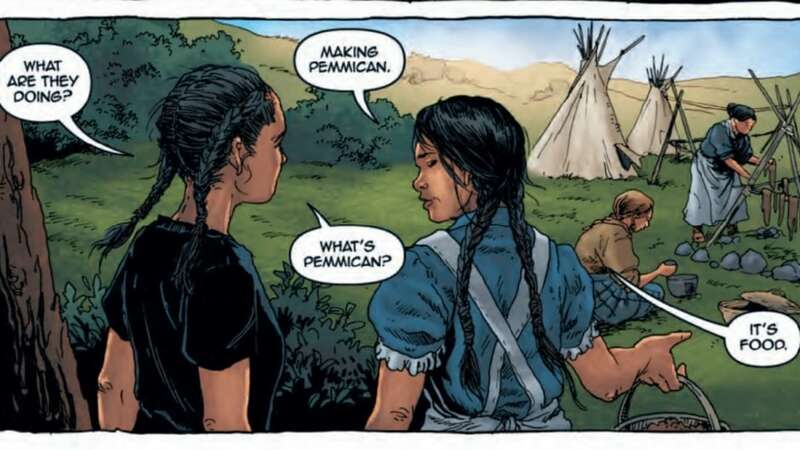 She’s a young Métis girl who transports back in time to important moments in Métis history. 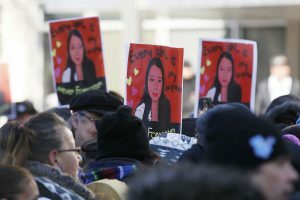 Vermette described her as a quiet teenager trying to find a sense of community and identity. 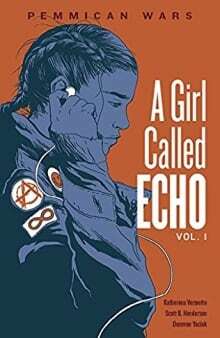 In the series titled, A Girl Called Echo, Vermette said the main character is a slipstreamer. She moves from present day to the past. In the first book, Pemmican Wars, she visits Saskatchewan in 1812 where she witnesses a bison hunt, visits a Métis camp and travels along fur trade routes. But Vermette said she didn’t want to explain the details of how Echo moves between worlds. She did say the visual representation of Echo and her worlds were created by a team. Scott B. Henderson was the graphic artist and Donovan Yaciuk was the colourist. For Vermette, writing about Métis characters and history is and important part of her work. A Blackfoot/Dene author says his first novel has been more successful than he could have ever imagined. The book, Secret of the Stars, made Amazon’s Top 10 best sellers in Native American literature. APTN News caught up with Gitz Crazyboy at his first book signing in Calgary. Click the image to see the full story from CBC Manitoba. It’s been five years since Althea Guiboche started the work that would earn her the title of Winnipeg’s ‘Bannock Lady’. 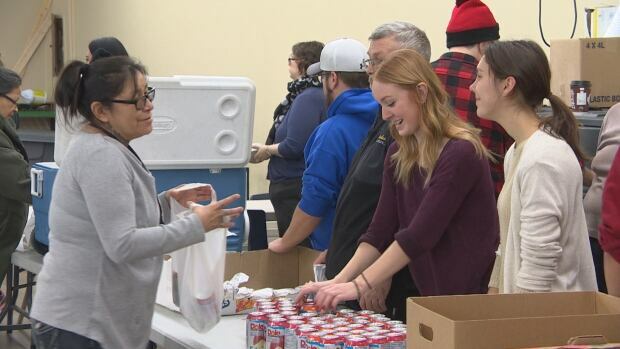 What started off as just Guiboche handing out bannock to Winnipeg’s homeless in 2013 has grown to an effort that now sees her and volunteers not only giving out a warm meal to people in need, but also working to create a community — or a village — as Guiboche describes it. The twice-a-month effort, known as Got Bannock?, marked its fifth anniversary this weekend. Guiboche and supporters celebrated with a community dinner Sunday afternoon. Guiboche started Got Bannock? after she found herself homeless with her three small children in 2011. Got Bannock? was officially registered as a charity in 2017 and since her own time living on the streets, Guiboche has become a well-known advocate for Winnipeg’s most vulnerable. The work has earned Guiboche a number of awards. “In response to my own homelessness this is what I’ve done,” she said Sunday. Among the volunteers who came out to help serve dinner at Sunday’s celebration was Winnipeg-born Olympian Clara Hughes. It’s the first time the former cyclist and speed skater has worked with Got Bannock?, something Hughes says fits right in with her work to raise awareness about mental health issues. “It’s a fantastic program that is providing nourishment for this community,” Hughes said of Got Bannock?. “Mental health issues manifest differently in every person but they affect more than one in five Canadians and when I look at what people need for wellness, food and nourishment is one thing and community is another thing… that is what is provided here. Got Bannock? serves up fresh meals on the first and third Sunday of every month, and Guiboche says each day sees 300 people fed. Amazingly all that work is still done without a permanent facility for storage. Guiboche says finding a space for storage and possibly opening a drop-in centre are among her plans for the charity going forward. NEW RELEASE: Two Plays About Residential School (Indigenous Education Press)- honours the fearless voices of residential school survivor Larry Loyie (Cree, 1933-2016) and intergenerational survivor Vera Manuel (Secwepemc / Ktunaxa, 1949-2010). 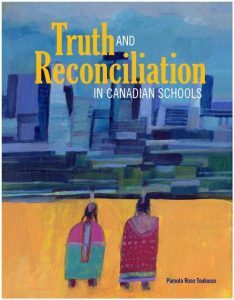 In the early 1990s, two Indigenous authors wrote about their individual experiences of residential schools. 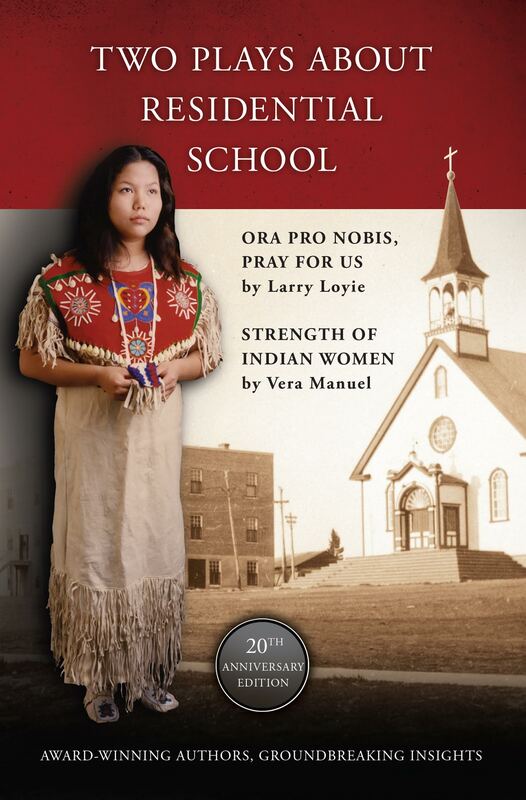 Ora Pro Nobis, Pray for Us by Larry Loyie and The Strength of Indian Women by Vera Manuel were staged a decade before Canada apologised for the residential school system, and 15 years before Canada’s Truth and Reconciliation Commission. Two Plays About Residential School is an updated version in honour of the 20th anniversary, from Indigenous Education Press (Brantford, Ontario). With honesty, and often humour, the authors reinforce the voices of survivors. “Two Plays About Residential School is essential reading along the path of truth and reconciliation,” says publisher Jeff Burnham, founder of Indigenous Education Press / www.goodminds.com in Brantford, Ontario. Larry Loyie spent six years at St. Bernard Mission residential school in Grouard, Alberta. His award-winning books include the national history Residential Schools, With the Words and Images of Survivors (Indigenous Education Press) and two children’s books on the subject, As Long as the Rivers Flow (Groundwood) and its sequel Goodbye Buffalo Bay (Theytus). In Ora Pro Nobis, Pray for Us, the lively friendship of a group of boys help them survive their residential school years. In Larry Loyie’s introduction to the play, he writes, “For Indigenous people, writing helps others understand who we are and what we went through. It’s a way to share our traditions and our healing journeys.” Larry Loyie spent more than two decades talking to students about residential school history, giving more than 1,600 presentations. Compassion, humour, and hope mark Two Plays About Residential School and the works of Larry Loyie and Vera Manuel. The anthology is a must for all readers, for teachers, libraries, and collections. Two Plays About Residential School is available from Indigenous Education Press /www.goodminds.com. To order, call GoodMinds.com, Indigenous book distributor, at 1 519 753 1185, Extension 1, or order online at www.goodminds.com. The book is $19.95, 120 pages, includes two full-length plays, author notes, production notes, photo credits.